Having carefully built my music library for years before streaming services were a thing, I still manually manage my collection. I try to maintain a star rating for songs in my most-played albums. 5★ I always want to listen. 4★ I sometimes want to listen. 3★ Meh. 2★1★ Why would I have a song this bad taking up space? From there, I create a smart playlist of the 5-star songs for each of my favorite artists. There’s currently more than 50 of these in my playlists folder. I do the same with genres (Classical, Post-Rock, Indie, etc.). It’s quite a bit of work to get all that, but the result is a really enjoyable way to listen to music I like. Aside from generally making a mess in my iTunes sidebar, and not being easy enough to start shuffled playback, my manual system misses artists that I like but haven’t yet realized I should make a playlist for, and thus I forget to listen to them. So I did what I do, and built an app. Download for iPhone/iPad. It’s also open source on GitHub. Heart Beats presents your library, sorted by Artist or Genre, filtered by those that have at least the minimum (set to 20 in the above screenshot) number of 5-star songs. Favorites ignore the song minimum (e.g. the Stromae playlist has 15 songs but is still listed). 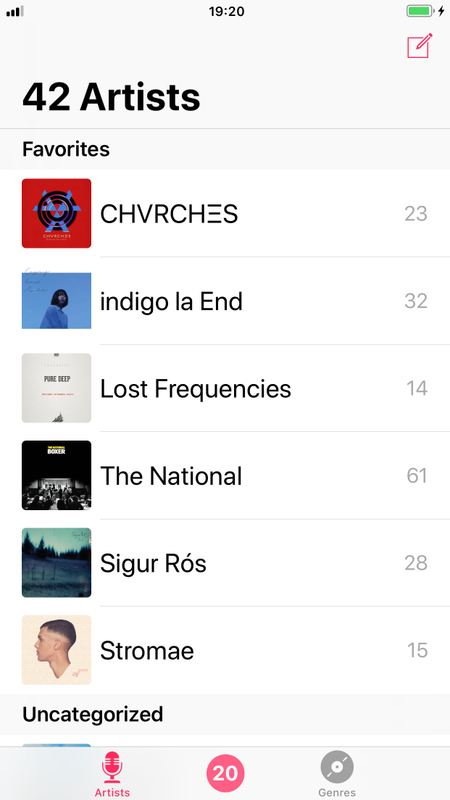 Tapping on any row will open the system music app, and sets the queue to those songs, shuffled. The app has replaced my haphazard manual collection of playlists, and saves me the need to dig through folders in the music app when I just want to start playing something while I start the car. It’s a pretty niche design for my use case, but if you invest the time to rate songs from artists you like, you might find it handy.